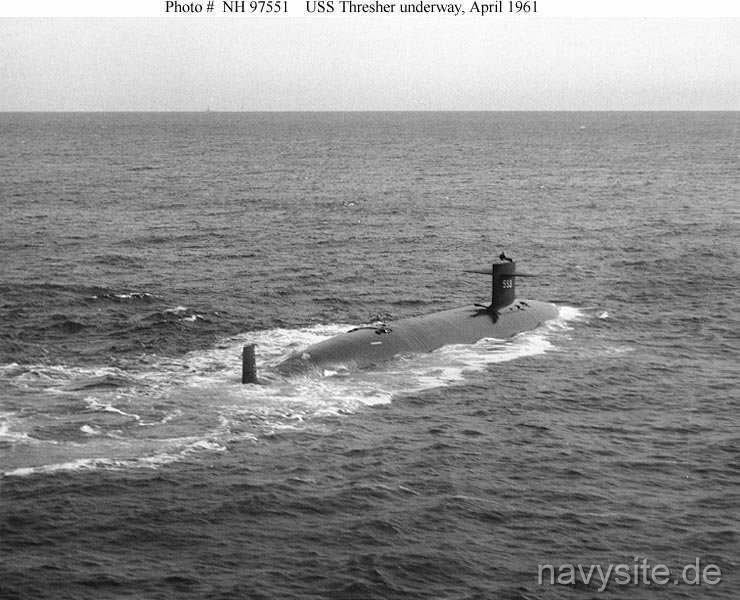 Built as the first ship in her class, the USS THRESHER was the Navy's second ship to bear the name. 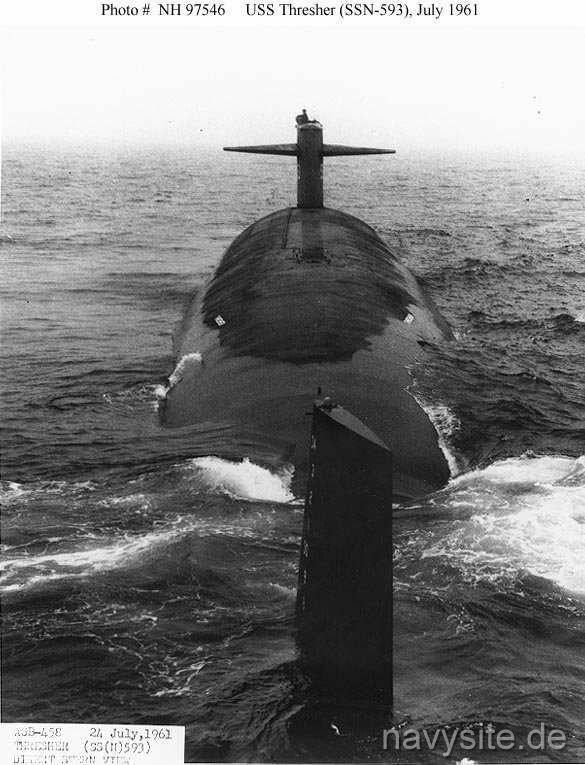 Lost on April 10, 1963, during diving tests about 220 miles east of Boston, her class was subsequently named after the second ship - the USS PERMIT (SSN 594). 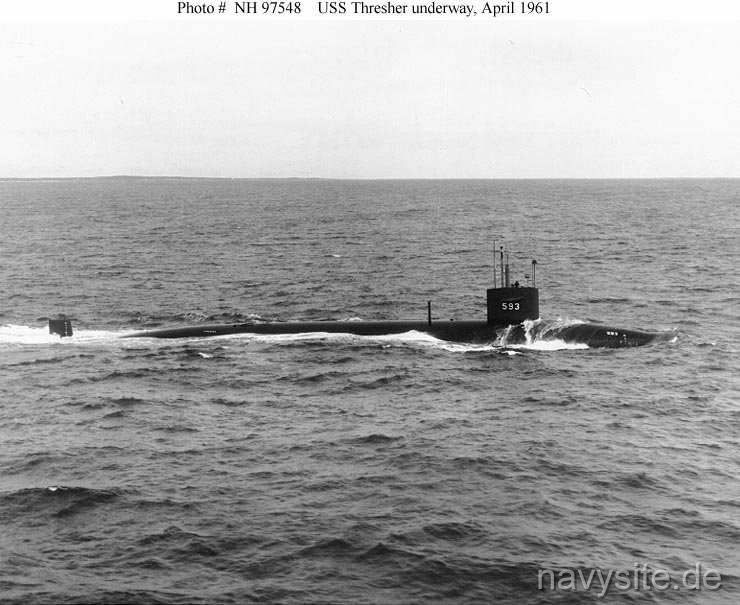 USS THRESHER was stricken from the Navy list on April 10, 1963. 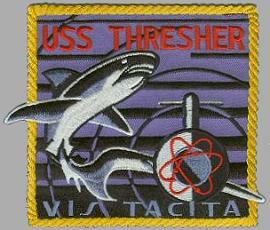 Click here to see which USS THRESHER memorabilia are currently for sale on ebay. During her seatrials, the USS THRESHER is docked at San Juan, Puerto Rico, with her reactor shut down and a diesel generator providing electricity to perform the usual docking procedures. After about 7 hours the diesel generator breaks down. While sailors are working to repair the generator, electricity is provided by an electric storage battery. However, the generator takes much longer to repair and the decision is made to restart the reactor. But since a nuclear reactor takes several hours and considerable electricity to restart and the THRESHER's battery is depleted before the reactor becomes critical. With no electricity to keep the ventilation system going, the submarine starts to heat up. Temperatures in the machinery spaces reach approx. 140 degrees Fahrenheit and some men are ordered out suffering from the heat and fumes, and the captain fears the heat and humidity could damage electrical equipment and lead to a general evacuation. Finally, the problem is solved by hooking up electrical cable to the diesel-electric powered submarine CAVALLA (SS 244) which is moored alongside early the next morning. With electricity from the CAVALLA, the THRESHER's reactor is able to be restarted. June 3, 1962 Port Canaveral, Fla.
USS THRESHER is damaged in a collision with a commercial tug berthing her at Port Canaveral. The collision results in a three-foot gash in the submarine's ballast tanks about one foot below the waterline. The THRESHER subsequently proceeds to New London, Conn., under her own power for repairs. April 10, 1963 approx. 220 miles east of Boston, Mass. 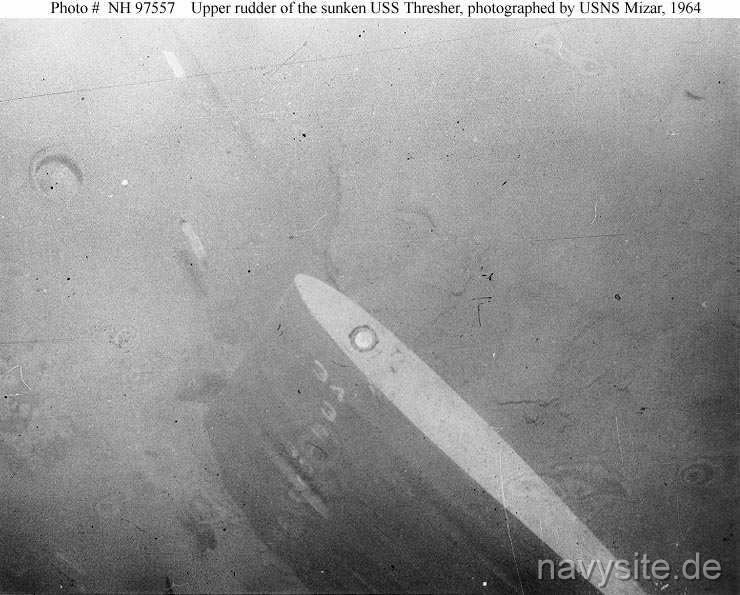 USS THRESHER sinks in approx. 8,400 feet of water while conducting post-overhaul trials The THRESHER is crushed by the water pressure, killing all 129 men on board. The Navy Court of Inquiry concludes a flooding casualty in the engine room brought about a piping system failure in one of the submarine's salt water systems is the most probable cause of the sinking. 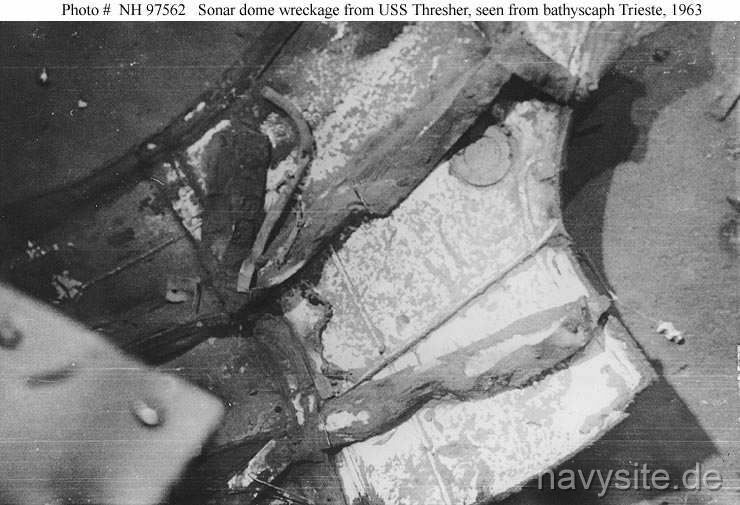 USS THRESHER is never recovered. 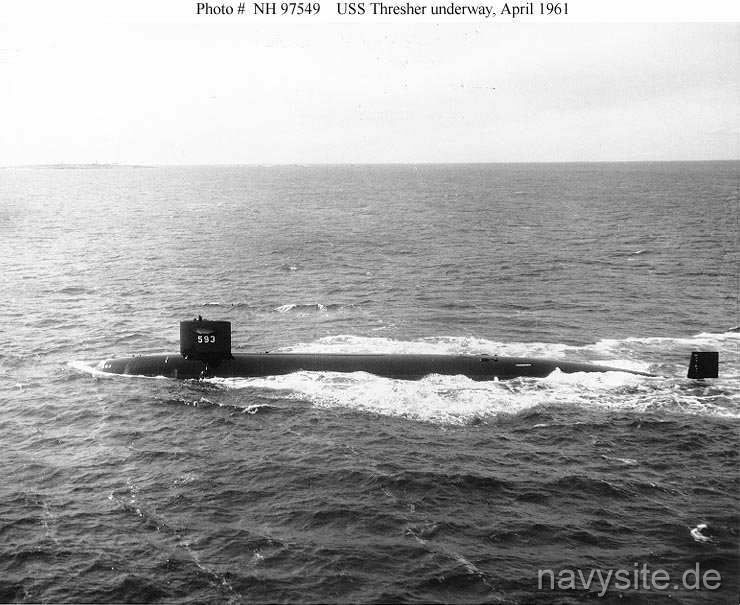 USS THRESHER was laid down on 28 May 1958 by the Portsmouth (N.H.) Naval Shipyard; launched on 9 July 1960; sponsored by Mrs. Frederick B. Warder; and commissioned on 3 August 1961, Comdr. Dean W. Axene in command. On 18 October; the submarine headed south along the east coast. After calling at San Juan, Puerto Rico, she conducted further trials and test-fired her torpedo system before returning to Portsmouth on 29 November. The ship remained in port through the end of the year and spent the first two months of 1962 evaluating her sonar system and her Submarine Rocket (SUBROC) system. In March, the submarine participated in NUSUBEX 2-62, an exercise designed to improve the tactical capabilities of nuclear submarines, and in antisubmarine warfare training with Task Group ALPHA. In company with SKYLARK (ASR 20), THRESHER put to sea on 10 April 1963 for deep-diving exercises. 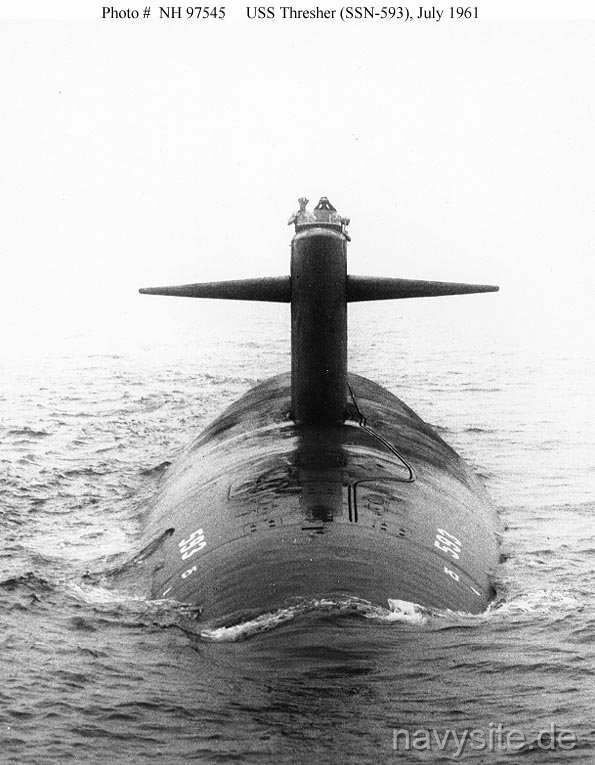 In addition to her 16 officers and 96 enlisted men, the submarine carried 17 civilian technicians to observe her performance during the deep-diving tests. Fifteen minutes after reaching her assigned test depth, the submarine communicated with SKYLARK by underwater telephone, apprising the submarine rescue ship of difficulties. Garbled transmissions indicated that - far below the surface - things were going wrong. Suddenly, listeners in SKYLARK heard a noise "like air rushing into an air tank" - then, silence. Efforts to reestablish contact with THRESHER failed, and a search group was formed in an attempt to locate the submarine. Rescue ship RECOVERY (ARS 43) subsequently recovered bits of debris, including gloves and bits of internal insulation. Photographs taken by bathyseaph TRIESTE proved that the submarine had broken up, taking all hands on board to their deaths in 1,400 fathoms of water, some 220 miles east of Boston. THRESHER was officially declared lost in April 1963.